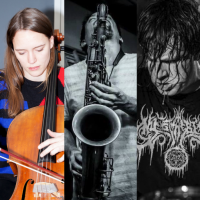 Tune in to Live Constructions at 10 pm on Sunday, March 6th for an exclusive in-studio set with Leila Bordreuil, Michael Foster and Weasel Walter. The show will feature a 45-minute free improv set with Leila Bordreuil on cello, Michael Foster on saxophones and Weasel Walter on drums. Leila Bordreuil is a Brooklyn based cellist, composer and sound artist from Aix-en-Provence, France. Her cello playing is often i﻿﻿mprovised, and mainly focuses on texture variations and a collage of phantom overtones and pitched utterances. Through an original vocabulary of extended techniques, preparations, and imaginative amplification methods, her instrument is used as an abstract resonant body to challenge conventional cello practice. Michael Foster is a Brooklyn based saxophonist and multi-instrumentalist working within the fields of free improvisation, composition (both graphic and notated), free jazz, noise, punk, and industrial music, and video. After studying Experimental & Electronic Arts at Bard College with Marina Rosenfeld, Richard Teitelbaum, and Thurman Barker, Michael moved to Brooklyn in 2012 studying with Charles Gayle, Ellery Eskelin, and Travis LaPlante. Weasel Walter is a multi-instrumentalist, composer and improviser. He founded The Flying Luttenbachers in Chicago in 1991, and has collaborated with Evan Parker, Elliott Sharp, John Butcher, Marshall Allen, Peter Evans, and Mary Halvorson, among many others.